Relaxation refers to a state of body and mind which is free from stress, tension, and anxiety. This article briefly outlines the importance of relaxation during pregnancy and different techniques to achieve this. The practice of relaxation helps to reduce stress symptoms and could ensure good health and wellbeing. Why is the relaxation during pregnancy important? Pregnancy is considered to be a time of joy and fulfillment. However, all the stressors of everyday life do not come to a standstill during this time. On the addition, some other pregnancy-specific factors get added. They include physiological changes in pregnancy, common pregnancy ailments, concerns regarding safe pregnancy and labour, and the worries related to parenting and wellbeing of the child. Moreover, a pregnant woman has had to accept a lot of restrictions/ lifestyle modifications in her life during pregnancy. They might include dietary changes, workplace adjustments, physical activities/ sports. All these factors could lead to emotional distress during pregnancy. However, the stressors affect individuals differently. Sometimes, pregnant women can find it challenging to cope with the stress response of the body. Relaxation could be a very useful tool to cope with the changes and stresses during pregnancy. Coping is defined as the conscious and behavioural efforts to deal with the stress. Although most pregnant women are unaffected, stress during pregnancy can sometimes lead to pregnancy complications or have an impact on the baby. Stress can predispose to many diseases later in life. For example, chronic stress can lead to heart disease, high blood pressure (hypertension), diabetes and mental health conditions (such as anxiety and depression), just to name a few. Studies have shown that relaxation techniques can reduce anxiety symptoms even in women with a high-risk pregnancy. Stress symptoms could have a significant impact on her quality of life. Before we discuss the symptoms, let us find out the underlying process of stress. 1. The stressor: Any factor, event or situation (real or imagination) that can trigger stress. 2. 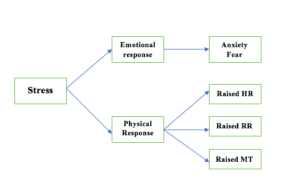 Perceived stress: The analysis of the stressor and perception of the individual as a threat. 3. Stress response: Activation of the body’s Sympathetic nervous system. This results in the physical and psychological symptoms of stress. Emotional/ psychological: feelings of anxiety and worry. Stress management strategies could extremely helpful in reducing the stress symptoms (both physical and psychological). Relaxation techniques are an important component of any stress management programme. These techniques are useful not only for the symptom control but also useful for those who do not have such symptoms. When they are practiced regularly (and become a part of the daily routine), they improve general health and wellbeing, and resilience to stress. How do the relaxation methods work? Homeostasis or the balanced state of the body is maintained by the interactions between the sympathetic nervous system (SNS) and parasympathetic nervous system (PNS). They act on the same organs of the body but initiate opposite functions. SNS causes ‘Fight or flight’ response, whereas PNS promotes the ‘Relaxation response’ or ‘Rest and Digest’ phase. When the SNS is activated then the PNS is inhibited. The stress response happens due to the activation of the sympathetic system. Therefore, the stress management strategies involve the activation of the parasympathetic nervous system. This is done through the activation of different parts of the brain which are related to the effective function of the parasympathetic nervous system. Relaxation achieves the opposite physical and psychological effects of stress. There could be stressors even during sleep, such as having a bad dream. Therefore, relaxation is required for a good health in addition to sleep and physical rest. What precautions do I need to take during pregnancy? Although the relaxation techniques are safe during pregnancy, please speak with your healthcare provider before you start, especially if you have a medical disorder (such as respiratory disease), mental health conditions (such as PTSD, psychosis, bipolar disorders, schizophrenia) or develop any pregnancy complication. Some techniques can evoke traumatic memories from the past or increase anxiety. How long should I spend on the relaxation techniques? 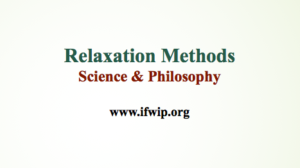 There is no agreed time frame to practice relaxation methods (to obtain the maximum benefit). However, it is generally advisable to spend about 30 minutes (over a period of 2-3 sessions) per day. What are the different ways to achieve relaxation? It is important to remember that every individual has their own ways of relaxation. Therefore an individualised approach is essential while considering any particular method of relaxation. Having some ‘Me Time’ every day is vital. This can be utilised for a hobby, such as reading a book, listening to music, participating in sports/ exercise (safe in pregnancy), painting or doing something you really enjoy. Interacting with your family and friends could be helpful too. Going for a short break or a holiday also could break the cycle of stress and help you to unwind. However, smoking, drinking alcohol or taking recreational drugs should be avoided. Although they might give you a temporary sense of wellbeing by working in a particular area of the brain, these unhealthy habits are detrimental to the health and wellbeing. Mind-Body Interventions (MBI) are based on the concept that the mind can influence and modify the physiological and psychological responses. They primarily do this through the activation of the parasympathetic nervous system (PNS). MBI focuses to strengthen the harmonic relationships among the mind, body, and the behaviour. This, in turn, have a positive impact on the health and wellbeing. Often, they are advised when someone is having stress symptoms. Deep relaxation is helpful in improving both the physical (such as palpitation, rapid breathing, and tensed muscles) and psychological symptoms (such as worries and fears) of stress. This technique helps to ease the muscle tension caused by stress. It involves active contraction followed by relaxation of a group of muscles systematically in a progressive manner. This is usually considered a very safe method to deal with anxiety symptoms. Professional guidance is not required to practice the Progressive relaxation method and can be done in the comfort of home. It usually requires 20-30 minutes, so could be useful for busy pregnant women. Simple instructions to practice this method could be found in some websites/ books/ podcasts. In this method, the pregnant woman visualises a soothing and relaxing image (such as a pleasant scenery) in her mind. This image could be real (where she has been before) or imaginary. Then she imagines that she is there to experience this herself. This process induces deep relaxation. Guided imagery can be practiced without a trainer and at home. Therefore a very cheap and convenient method of stress reduction. This method is based on the concept that a positive and calming thought can activate the parasympathetic system. Deep breathing is a safe, simple and effective method of combating stress. This could be practiced alone as a method of relaxation. However, often, this is an integral part of different meditation techniques and yoga. This can be done anywhere and does not require a trainer. This method is particularly helpful if practices regularly as a part of the daily routine. Pregnant women should avoid holding a deep breath (can reduce fetoplacental circulation). There are some other less-known deep relaxation methods, such as autogenic training and biofeedback. However, they are beyond the scope of the current article. Although the hypnosis can induce a state of relaxation, it is usually used as a therapy in certain health condition, rather than as a relaxation technique. Hypnosis is an altered state of mind (‘trance’) where the person is very acceptable for suggestions. The practitioner uses hypnosis techniques to develop this state with the cooperation of the person. Once the trance state is achieved, the practitioner then suggests some positive suggestions related to the health condition. Hypnotic therapy is based on the concept that, in the trans state the subconscious mind is very receptive to suggestion. It is thought that during the hypnosis the conscious mind is dormant or distracted. Therefore, during this, the normal critical nature of the mind is bypassed. Hypnosis could have some side effects, such as a headache, dizziness, nausea, anxiety, or panic attack. Hypnotherapy principles are used as a pain relief method during pregnancy. Research has shown that regular practice of meditation can lead to a state of deep relaxation. 2. An absence of (both good and bad) thoughts, emotions, bodily sensations, and self-awareness. This is not achieved through sleep. EEG (electroencephalogram) studies have shown that meditation creates a high amplitude (5-7 Hz) Theta waves. This implies inhibition of the parts of the brain (mainly frontal cortex) which are responsible for so-called ‘executive functions’ of the brain (such as thoughts, emotions etc.) during meditation. This involves directing the attention to one specific object, usually breathing, mantra recitation (word/ sound/ sentences) or an object (real or imaginary) or feelings (‘Compassion’ and ‘Loving Kindness’ meditation). The aim is to achieve calmness of the mind by maintaining focus/ concentration and avoid wandering of the mind. The participants focus on mantras (word/ sound/ sentences) either spoken aloud or silently in the mind. These practices either focus on the feelings of kindness, love, and joy (‘Loving Kindness’) or cultivate compassion for the suffering (‘Compassion’) towards themselves and all humanity. This aims to observe all the mental processes (emotions, thoughts, and sensations) at the present moment and follow them as they come and go. The primary goal is to develop an attitude of accepting anything that appears in the conscious mind. Mindfulness meditation is an example of Open Monitoring meditation. b) Breathing exercises (‘Pranayam’): this is helpful in relaxation and reducing stress. c) Meditation: this helps to develop a calm and balanced state of the mind. There is no evidence to support that yoga can be used as a stand-alone curative treatment for medical conditions during pregnancy. Yoga is considered as a safe form of exercise during pregnancy (except ‘Hot Yoga’). However, some special precautions are required while doing yoga during pregnancy. For example, an exercise in the supine position should be avoided after the second trimester and certain specific Pranayam should be avoided. It is always advisable to join a pregnancy-specific yoga class and perform yoga under the supervision of an instructor who is experienced and trained in pregnancy yoga. There is very limited research done on the other Mind-Body interventions, such as Tai chi and Qigong, for their use in pregnancy. Massage and aromatherapy have been used as relaxation methods, however more scientific research is required in these areas. This is the use of essential oils to stimulate the olfactory system. The aromatherapy practitioner can offer inhalation of essential oils (extracted from flowers, plants, fruit, and seeds) only or along with a massage. This aims to help in relaxation and reduce stress and anxiety. Studies have shown that aromatherapy using essential oils inhalation (containing linalyl acetate and linalool) and aromatherapy massage using Lavender oil can help in relaxation and stress management. Please speak with your health care providers first before you start any form of therapy. Further information on the use of aromatherapy during pregnancy could be found here. There is some evidence to suggest the benefits of massage to improve depression and reduce anxiety. One study showed that when combined with pregnancy yoga, massage can reduce anxiety, depression, back and leg pain. Abdominal massage (prevalent in some countries) must be avoided. Supine position (lying flat) should be avoided during massage after the second trimester. This involves manual stimulation of the 10 acupuncture points (Tapping Points) of the body. This is done through a tapping technique using fingers. EFT is a combination of rhythmic tapping on acupressure points coupled with targeted affirmations. The words are tailored to target the problem while the tapping smoothes out energy flow through the meridian network of the body. 1. Time for relaxation should be an integral part of the daily routine for everyone, including pregnant women. 2. Every day at least 30 minutes (may be divided into 2-3 sessions) should be spent on one or more methods of relaxation. 3. Many relaxation methods are simple and can be performed safely at home, without a trainer and additional expenses. 4. Relaxation is essential along with adequate rest/ sleep. 5. These methods can improve both physical and psychological symptoms of stress. 6. Relaxation techniques should be performed even without stress. This could improve general health and wellbeing. 7. Advice from your healthcare provider is essential before you start any relaxation method during pregnancy. 8. Use of Mind-Body Interventions (MBI) and Complementary and Alternative Medicine (CAM) is increasing among pregnant women. Please speak with your healthcare provider before opting for any specific method. It is also vital that you speak with a qualified practitioner of MBI and CAM. Please check with the Regulatory organisation in your country regarding this. 1. Lippelt DP, Hommel B, Colzato LS (2014). Focused attention, open monitoring and loving kindness meditation: effects on attention, conflict monitoring, and creativity–A review. Frontiers in Psychology 5.